from the parallel cativerses dept. #caturday Are Parallel Universes Real? A few weeks ago YouTube added 'collections' to manage your subscriptions. 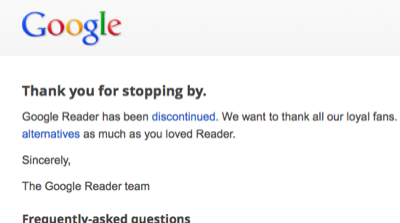 Google Reader was tool to subscribe to feeds and manage them in collections and read the articles at your leisure. YouTube is a tool to subscribe to channels and manage them in collections and to watch the videos at your leisure (and to publish your own videos). If it is kinda lame to read the articles on your own terms because we consume news in bits and bites throughout the day based on our timeline and Google's insights now, as they say, then why is Google implementing and expanding this deprecated structure in YouTube? Why isn't Google killing subscriptions and collections in YouTube too, since it just could serve users a random stream of viral videos, or videos posted by their friends, or great according to some algorithm based on some secret Google juice? heh, Aol is building a feedreader too: http://reader.aol.com/ - if even Aol gets the value of a feedreader Google is really looking like a doofus now. hmm, Microsoft's so.cl http://www.so.cl/ (which g+ doesn't like to embed) is actually better looking than G+. "We’re doing the launch in phases because, as you might have guessed, RSS aggregation is a hard thing to do at scale, and we want to make sure the experience is as fast and reliable as possible. Everyone will have access by June 26th." "I think I’ll have all the mashed potatoes.’"
Am I missing sth. or is G+ quite a dud at I/O? There are a few sessions for publishers (how to add buttons and badges), a lot of sessions on how to add G+ Sign-In, and, well, that's about it. No read API, obviously no write API, no API for the social graph, for search and discovery, not even RSS for the posts. A Boy And His Atom: The World's Smallest Movie; Making of.